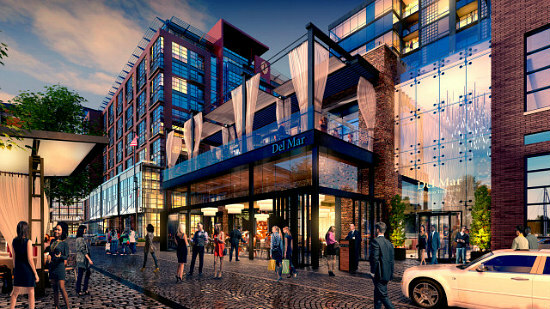 Once the second phase of development concludes in 2021-2022, the 27 acres bound by the Washington Channel on the southwest and Maine Avenue to the northeast, between 6th and 11th Streets SW (map) will be practically unrecognizable to those who are long-time patrons of the country’s oldest continuously-operating fish market, a nexus point of the redevelopment which will also get a face-lift and an expansion. The official unveiling of the first phase next week will kick off with a suite of events. Today, UrbanTurf is taking a look at what visitors (and new waterfront residents) can expect to be open. The condos at 525 Water Street SW (map) were the first residential units to deliver as part of the first wave of Wharf redevelopment. Incanto’s 148 rental apartments at 770 Maine Avenue SW (map) delivered in August. 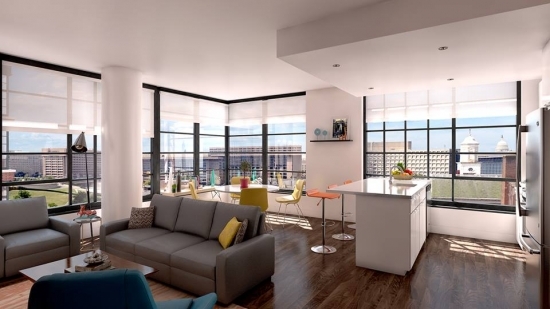 The Channel, one of the larger individual Wharf developments, will begin delivering its 501 apartments this month. The building at 950 Maine Avenue SW (map) has one of the city’s most expansive amenity packages, including a one-acre courtyard on the sixth floor with an infinity pool, bocce courts, dog run, library and cabanas. VIO DC, the 12-story condominium development at 750 Water Street SW (map) is slated to begin delivering next week. The luxury units, which began selling in 2015 at prices approaching $1,000 a square foot, range in size from 480 to 2,650 square feet in size and include features like waterfront views and private elevators to The Wharf promenade. The office buildings delivering this phase include the 11-story buildings at 1000 Maine and 800 Maine, as well as the Pier 4 building, which literally sits on a pier over the water. Out of four planned hotels with 800 rooms, three are delivering next week: Canopy by Hilton, the brand’s first location in North America; Hyatt House, an extended-stay hotel; and an InterContinental Hotel. District Hardware and Bike on the ground floor of Incanto at 770 Maine Avenue SW (map). Requin, a French Meditterrean restaurant from chefs Jennifer Carroll and Mike Isabella. Restaurants La Vie, Florentijn, Kaliwa and Lupo Marino are expected to open by mid-November. The Anthem occupies the lower floors of The Channel at 950 Maine Avenue SW (map). The music venue is run by IMP, the team behind the 9:30 Club, and has a variable capacity of 2,500 to 6,000 people. 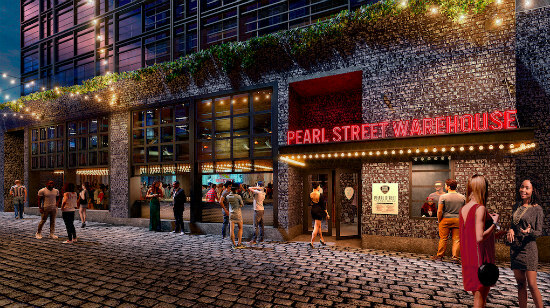 Pearl Street Warehouse is a live music venue that will primarily feature bluegrass and Americana artists. Food will also be served at the 300-person hall, which will be located on cobblestone pedestrian-friendly promenade Pearl Street. Another music hall on that street will be the 450 person-capacity Union Stage, a venue owned by the Jammin’ Java team and expected to open next month. Public Spaces on the Wharf will eventually include the expanded Maine Avenue Fish Market, a mile-long pedestrian promenade, and amenities such as a free kayak and paddleboard launch, swings, seating and seasonal ice-skating area. 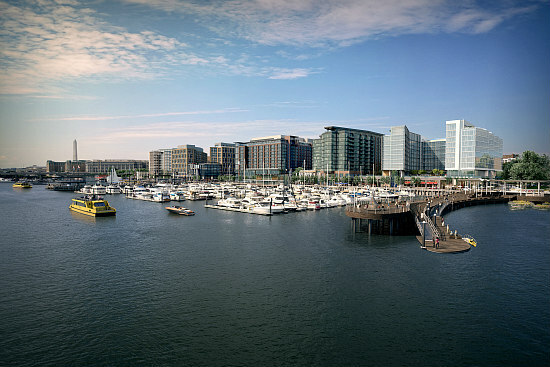 In the meantime, the first phase opens with four piers, including the bifurcated Recreation Pier, with a fire feature called The Torch, swings and other seating; the District Pier, with access to the Wharf Jitney, electric-powered water taxis from the District Pier to Hains Point and East Potomac Park; and the 7th Street Pier, an extension of the 7th Street Park.